If you left the Whitney Forum early last night you missed one heck of a comeback by the Flin Flon Bombers, who erased a 3 goal deficit in coming back to stun the Battleford Stars 6-5 in OT. The Bombers trailed the Stars by 3 goals on two different occasions last night, but never gave up and found their offense in the third period. Battleford who were trying to bounce back from a 5-2 setback the night before came out and owned the first period. Ryder Richmond opened the scoring with a nice wrist shot from the point to put Flin Flon up 1-0 just 2:31 into the contest. The Stars responded with 4 straight from Dayton Heino who scored twice, and Austin Shumanski and Braydon Buziak also scored to put Battleford up 4-1 after 1. Brandson Hein made it a two goal deficit when he fired his 37th past Joel Grzybowski just under neath the bar early in the second. Battleford would restore the three goal lead with Ryan Gil tapping a puck past Jacob Delorme who came in relief of starter Gabriel Waked who was pulled after giving up 3 goals on 11 shots. With the Stars leading 5-2 to start the third I thought if Flin Flon could get a goal early in the period it might be the spark they need. Caleb Moretz answered the bell and made it 5-3, just 1:29 into the third period. The Bombers kept piling it on, and Brandson Hein would score his league leading 5th short handed goal when he intercepted a Stars pass and went in alone on Grzybowski, tucking a puck between his legs to send the Whitney into a frenzy. Specialty teams were the name of the game in the third as the Bomber powerplay would get going on a 5 on 3, and captain Nate Hooper was left alone on the left side of the net to collect his 21st of the season. 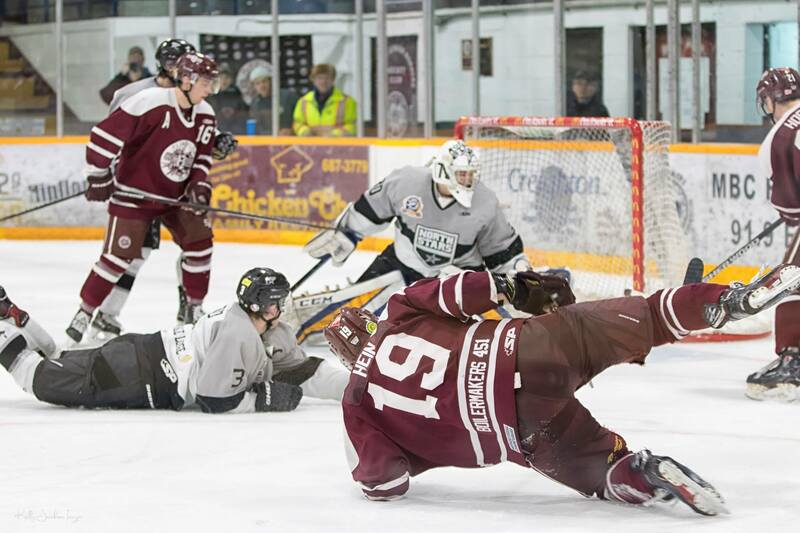 Flin Flon had stolen the momentum and you had the feeling it was just a matter of time. Nate Hooper was at it again , this time taking a Brandson Hein rebound and sliding it past Grzybowski for the Ot winner and one of the biggest celebrations I have witnessed in a long time at the famous Whitney Forum. I felt bad for Grzybowski who made a lot of big saves in the game especially late in the second to keep his team in it. His team mates took some bad penalties and were not there for him in the end. Final shots were 51-42 in favour of Flin Flon and power plays saw the Bombers and Stars both go 1 for 5. This is the 9th straight win for the Maroon and White which has them second overall with 60 points, and just 5 back of the Nipawin Hawks with two games in hand. These two teams will meet Tuesday night for the fifth time this year and the Hawks leading the season series 3-1. 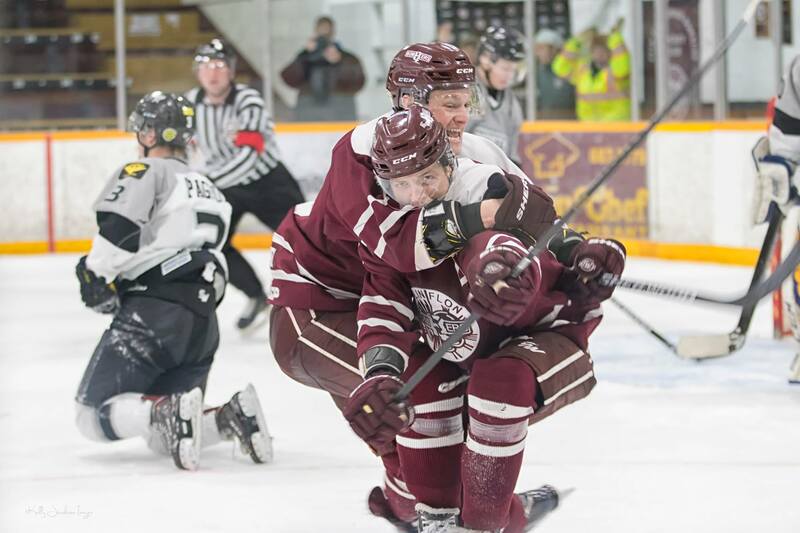 Flin Flon did take the last meeting 4-1 in their make up game January the 8th. I can hardly wait as it is always sensational hockey when these two Sherwood rivals square off. The Bombers have lots of momentum and I know are very much looking forward to the challenge. Don't forget to join us for all the action on 102.9 CFAR and flinflononline.com as we hit the air with the Great North GM Coach's Show at 7:10 and drop of the puck at 7:30.